Perhaps this has happened to you. You go to buy something at the store. It's been a busy week, so you haven't been watching your bank balance as closely as you should. The cashier rings you up. You swipe your check card and the cashier says, “It didn't go through. Do you have another card?” What happened? A check card draws money from your checking account, so your balance must have dipped too low to pay for your purchases. It happens. Well... not anymore, it doesn't. I switched my checking account to Bank of America a few years ago when I refinanced my adjustable rate mortgage into a home equity line. Back then, my credit was solid and it seemed like it would be easier to have my checking account within easy reach of my second mortgage and my Bank of America credit card. And like my other bank, Bank of America sent me a check card so I could make purchases with the ease of a credit card, minus all those pesky finance charges. The first time I received an overdraft fee, I didn't think much about it. When you buy gas, the charge doesn't always show up right away and if you forget to keep track of your pending charges, sooner or later you're going to overdraw the account, especially if you're living paycheck to paycheck. The fee was hefty, but it was a small price to pay to make sure my charges were covered. Bank of America would have commended me for my attitude. Then things started getting tight between paychecks, with more and more checks and charges floating around, and I started getting negative balance numbers that looked strangely plump. I thought maybe someone over the internet had stolen my account number, but the charges were all mine. In fact, I'd made several of them that same day. Twenty dollars here, six dollars there, twelve dollars somewhere else... and even though the balance must have been precariously low when I made the first of the three transactions, I was sure that the other transactions should have been declined. Furthermore, the fact that those two had gone through after the account dipped below zero meant that Bank of America had assessed another $70 in overdraft fees. If I went to an ATM and tried to withdraw the same amount of money, Bank of America would have checked the balance and said, No dice. If I used my check card, on the other hand, it would authorize the charge regardless of whether or not I had money in my checking account. What mad, tortured logic was this? I could understand having to pay a fee when one too many floating charges collided because I hadn't been keeping a balanced checkbook. What I couldn't understand was how transactions kept getting approved after my account dipped below zero. It didn't make any sense. It seemed logical to me. 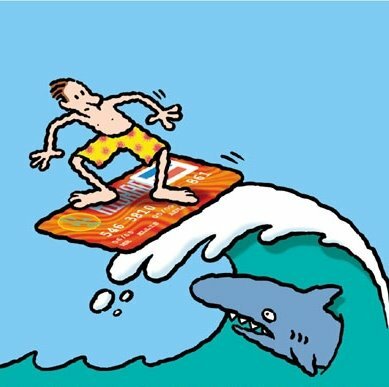 If I was to be penalized for using the card when my available balance was too low, that was fair, but if the credit card company could stack fees on top of each other until I got another over-the-limit fee, that was ridiculous. What Bank of America was doing with my check card charges seemed equally ridiculous. In a single month, Bank of America charged me $350 in overdraft fees, spread out over ten separate charges. Many of these charges should have been declined in the first place, but I was noticing something else. Bank of America had an ugly habit of clearing charges in order from largest to smallest, often draining the account with the first charge and causing multiple overdrafts when clearing them in order would have overdrawn on only the largest transaction. This policy was the source of class action lawsuit against Nationsbank, which became Bank of America, that was settled in 1999. Since then, they've been informing new account-holders of the policy per the settlement agreement, but I don't recall being told about the policy by the manager who set up my account. I'm sure it's in the stack of papers he gave me to sign, or in the folder full of pamphlets I didn't have time to read after the account was processed. The check clearing policy, however underhanded, is now an industry standard. Most banks will clear your largest checks first, claiming that this is “for your own good.” You want your mortgage payment to go through, don't you? What they don't say is that the three or four smaller transactions after the mortgage payment will go through as well, to the tune of $140. Though the Bank of America Visa Check Card is accepted nearly anywhere VISA Cards are accepted, it's not a Credit Card and it's not tied to a line of credit. Fair enough, but if it's not really a credit card, why do so many transactions go through after you overdraw your account, sometimes days after your account has fallen to a negative balance? We charge an overdraft fee when we pay a check or other withdrawal even though you don't have enough available funds in your account to cover these transactions. In some circumstances, Bank of America may choose not to pay the check or other withdrawal. In this case, we will return it to the payee as unpaid, and may charge an Insufficient Funds Fee. So, if they decide to pay the charge that should have been declined, they assess a fee. If they decide not to pay the charge, they also assess a fee. That's a pretty profitable arrangement. How exactly do they decide whether or not to pay a fee? Is it even possible to drop so far into negative numbers that your check card will be declined? A few months ago, I found out the limits of Bank of America's largess when a series of overdrafts and the accompanying fees brought my account balance hundreds of dollars into the negatives. Knowing that the paycheck that would be direct deposited would be eaten up by the negative balance, I had no choice but to keep using the card to buy food and gas, each time watching yet another $35 fee join the transaction. $50 in gas? Let's just call it gas and a short term loan. A $35 fee for every purchase would be criminal if it was actually a finance charge, something akin to what a loan shark might charge, but I didn't have any choice if I wanted to gas up my car to go to work. It seemed like they were willing to pay on anything as long as they could attach another overdraft fee, so I took one final look at my balance, $-643 and change, and I paid my electric bill. To my astonishment, the transaction was actually approved. I really hadn't expected it to work. A few days later, Bank of America changed its mind about this act of extreme generosity and canceled payment, charging me both the original overdraft charge, as well as the returned item fee. Remember that thing I mentioned about their “biggest items first” policy, and how it was for my own good? I didn't use the card any more after that, but I forgot about a monthly membership charge that automatically debits the checking account in the amount of $9.96. That charge went through AFTER they declined to pay the debit to the electric company, and it was approved and paid, with the standard $35 overdraft fee tacked on, of course. The policy of letting transactions go through even after an account's available balance reads $0.00 has become standard in the industry, and it's not even limited to check cards any more. My wife used a SunTrust debit card to buy about $50 worth of groceries last night, entered the PIN number at the Publix register, received approval and went home thinking that the charge was covered by money in the account, only to find a negative balance in the morning and a returned check fee. I had a previous girlfriend in this circumstance, and it's despicable. Unfortunately, it allows the person that may be living from paycheck to paycheck to make the spending decision, which isn't much of a decision when you need to eat and drive to work. Oh I'm with ya. My bank permits you to go 'over' by $600 dollars. Citibank declines to pay out charges on debit cards when there's not enough money to cover it in the account. For a fee, some banks will extend a line of credit with overdraft insurance of a few hundred dollars without assessing overdraft charges when used. I don't bank with companies that assess a checking fee, it's rediculous for a bank to charge you for holding your money. The local bank where I used to live had free checking accross the board, Citibank and many others offer free checking for students. I would shop around for free checking. I was once lured in by Bank of America's add campaign for "free checking," only to find out after I had opened the account that it's only free when there's $750 in the account. I complained and they retroactively took off the checking fees, I later left them because of ther crooked schemes you described. Most banks will allow you to go over your limit in the account but at hefty fees. Some charge $30-$40 per overdraft. Even if you overdraw by $1 you still pay $30-$40 in overdraft fees. We switched from BOA several years ago. We had an automatic deduction on our mortgage set to be deducted on the first of the month through their bank and paid to the mortgage company. BOA deducted the money a day early. This meant that I bounced a heck of a lot of checks and charges, which they covered and then charged me a fee for each and every one of them. We owed BOA some incredible amount of money--several thousand. Even though it was their error, they refused to reverse the charges. They also refused to let us close out the account until we'd paid up. We quickly switched banks but kept the account open. We never did resolve it with BOA. They referred us to a collection agency who eventually settled with us for less than the original amount of the debt. We paid it using our tax refund. I would never recommend BOA to anyone. Not only do their banking practices seem questionable at times, but it's impossible to resolve issues with them. I also no longer allow any one to "automatically" debit any charges from my account. It is convenient when it works right, but when it doesn't, it's a nightmare. it's really strange that they allow the highest value purchases go through first, followed by the lesser purchases. there have been times I would've only overdrafted once (instead of literally 10 TIMES=$350!!!!) i also KNOW i made the purchases according to my current balance, so that i wouldn't overdraft, and because of the way they pushed them through, my account was terribly overdrawn with very little hope of getting my finances back in order. i agree with you! Keep track of your money people and this won't happen. I don't make alot of money and I have NEVER overdrawn my account. There are so many tools to use to check your balance before you use the card; internet banking, telephone, ATM machine or just keeping a ledger. Most banks will refund a fee for the one time you make a mistake. It is your money, your responsibility. I love how quick people are to blame their own irresponsible behavior on the bank.